Port Antonio and the surrounding region are quiet havens of chic resorts, gorgeous seascapes, mountain vistas, and true Jamaican hospitality. Arriving in Kingston this morning, you will be greeted by your driver and transferred by private car to Port Antonio, a drive of 2 ½ to 3 hours, depending on traffic. Once in Port Antonio, check into your eco-chic resort, nestled high on a hill above the city. With 6.5 tropical acres the hotel’s elevated location offers gentle cooling breezes and superb Blue Mountain and Caribbean Sea vistas while overlooking Port Antonio’s beautiful double harbor. The location is spectacular by day and romantic by night. 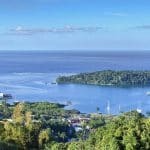 Jamaica’s Port Antonio, with its timeless tranquil charm has been a quiet favorite since Errol Flynn first purchased a house and the nearby Navy Island. Built around an exquisite natural double harbor at the foot of the Blue Mountains, a walk through this rural township is like stepping back into its Spanish and English colonial past. Buildings that line its streets include a 19th-century neo-Romanesque Anglican stone church and the charming gingerbread DeMontevin Lodge. Spend you’re afternoon at leisure by the pool or wandering the gardens. 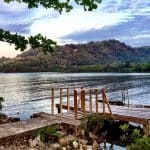 Alternatively, your hosts can arrange transportation if you would like to visit a nearby beach or walk through the busy streets of Port Antonio. Dinner at your hotel’s restaurant is included this evening. Everything on the daily-changing menu here is homemade, using ingredients from local farmers and small producers. The menu is a fusion of Caribbean and European cuisine; organic, local, healthy food, with great friendly service. This morning, you have the option of arranging a peaceful boat ride through the Blue Lagoon, a natural lagoon whose jewel-like colors change from sapphire blues to turquoise green throughout the day. Renamed after the film the ‘Blue Lagoon’ was filmed here, the lagoon is 180 ft deep and is fed by a combination of ice-cold deep springs and the warm Caribbean Sea. With its vibrant colors, the setting makes for glorious swimming and striking photographs. Located seven miles outside of Port Antonio, the best way to access the Lagoon is by boat. Your hosts will assist you, arranging transportation and the private boat ride with a local captain if you wish. Alternatively, you have the option to spend the morning slowly rafting on the Rio Grande River. This wonderfully scenic boat trip is rumored to have been started by Errol Flynn during the 1940’s. Today passengers make the 6-mile journey over 2 ½ hours, from Grant’s Level or Rafter’s Village, a mile east of Berridale, to Rafter’s Rest, at St Margaret’s Bay. 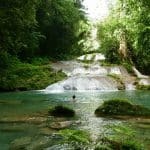 Experience a taste of rural Jamaican life along the riverbanks, where women and children bathe and wash clothes, shore side peddlers strum guitars for a tip, and others sell sodas and coconuts, often from other rafts. En route you’ll pass through Lover’s Lane, a moss-covered narrow stream where you’re supposed to kiss and make a wish. A picnic lunch can be arranged by request. Spend the afternoon at Frenchman’s Cove. Here, a small stream winds lazily down to a white sand beach shelving steeply into the water. Enjoy the best of both worlds, fresh and sea water. There is a snack bar beside the beach and lounge chairs are available along the edge of the sand. The daily fee to visit this beach is included in your room rate. Either schedule your return transfer before leaving the hotel, or, when you are ready, walk to the gatehouse, where the beach attendant will be happy to call a taxi for you. Dinner is included at your hotel this evening. This morning, depart after breakfast for your privately guided visit to Reich Falls (pronounced Reach). Meet your driver in the lobby and set out on the 40-minute drive to Ecclesdown, where you will leave the main road. A spectacular one-mile drive brings you through the valley of the Driver’s River and into the foothills of the John Crow Mountains. Jamaica is famous throughout the world for its waterfalls. Reich Falls, a stunning series of cascades which tumble over limestone tiers from one hollowed, jade-colored pool to another, are off the beaten track. Often, you will find that you have this quiet paradise all to yourself. We recommend getting to the Falls before mid-morning to enjoy the best light as the sun hits the river. The Reich Falls pools are differing depths, suitable for all levels of confidence and swimming ability. Strong swimmers can explore the underwater caves with the guide and jump from the high up on the rocks into the deep pools. That said; do follow the advice of posted signs and, “Beware of deep pools and strong currents.” A half mile hike upriver through the tropical rainforest leads to Mandingo Cave, with a natural waterfall inside and a whirlpool. Well worth the hike. A picnic lunch can be arranged by request today as well. More ambitious hikers have the option of setting out early and beginning the day with a hike from Ecclesdown to Reich Falls, a trek of about 5 hours. ** The route is mainly forested and shady, overlooking a valley which is an excellent area for birding. Along the way there are points where you can see the coast behind the range of hills. Landscapes here are lush, with many species of plants and ferns. The last stretch takes you through farmlands and small communities, ending at the corner where the road branches to Reich Falls. Before returning to your hotel, you may wish to stop at Long Bay. This white-sand beach is wonderful for romantic walks. The undertow often rules out swimming here, but it is great for bouncing about in the waves, some lazy sunbathing, a drink and a game of dominoes at the beachside restaurant. Dinner at your hotel is included this evening. This morning, meet your driver and set out for historic Charles Town, an important Maroon community. Maroons, runaway slaves from nearby lands, formed independent communities on many Caribbean islands, facing difficult odds and often hostile neighbors. By all accounts, Jamaican Maroons maintained the most successful, politically and militarily formidable, strongholds in the region. Charles Town is an important Maroon community, settled after the signing of a peace treaty between the British and the Maroons in the 18th century. Of note, the settlement is the home of the descendants of national heroine Nanny, who freed more than 800 slaves during her lifetime, helping them to resettle in the Maroon community, and the Maroon hero, Quao, known as the “invisible hunter”. Set off on a moderately-difficult 2-hour hike (one way) through lush vegetation which provides ideal bird watching opportunities. The trail begins by crossing the Rio Grande River and climbing up the hills on the other side, crossing streams and waterfalls en route. If you wish, stop to cool off in the cascading waters. There is a “swing basket” used to cross the river when it is swollen. The hike ends at the ruins of an 18th-century coffee plantation notable for its size. Its detailed structure gives insight into 18th-century life. The return hike ends at Quao’s Village where you can enjoy a traditional picnic lunch and a swim in the river. The return hike is approximately 2 hours as well. To round off the day, a picnic lunch by the riverside and a visit to the museum at the Asafu Yard, a thatch hut museum filled with Maroon artifacts and healing herbs. Return to Port Antonio, where you will have some time at leisure before enjoying your final delicious dinner. Return to Kingston in time for your return flight or the next part of your Willing Foot journey.